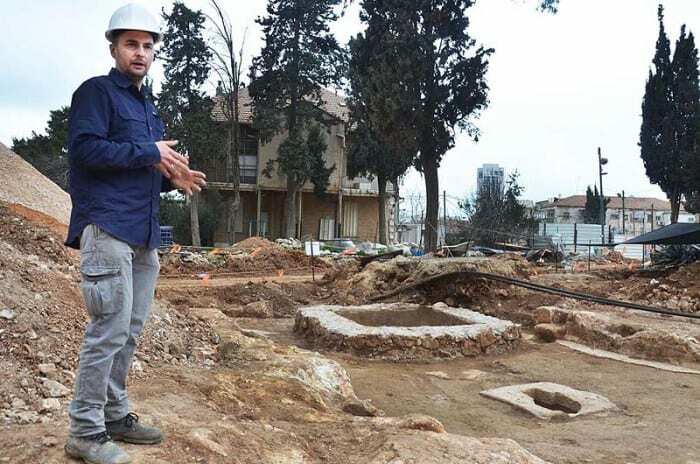 Large Ancient Winery, Roman Bathhouse Unearthed in Jerusalem - Breaking Israel News | Latest News. Biblical Perspective. 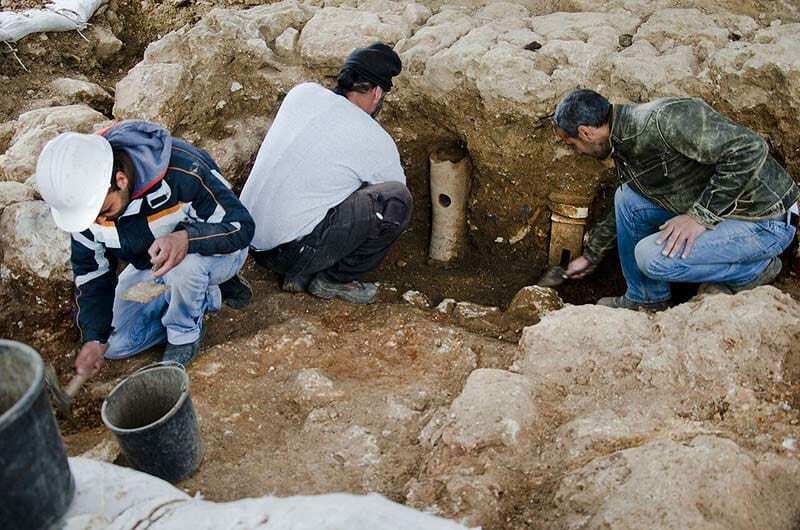 Unexpected finds, more than 1,600 years old, were uncovered during archaeological excavations of the Israel Antiquities Authority in the Schneller Compound in Jerusalem before the start of construction of residential buildings for ultra-orthodox residents. The project is financed by the Merom Yerushalayim Company. Interesting finds from Jerusalem’s past were discovered in the archaeological excavation, most notably a large and impressive winery dating to the Roman or Byzantine period, some 1,600 years ago. The complex installation includes a pressing surface paved with a white mosaic. In the center of it is a pit in which a press screw was anchored that aided in extracting the maximum amount of must (freshly pressed fruit juice that contains the skins, seeds, and stems) from the grapes. Eight cells were installed around the pressing surface. These were used for storing the grapes, and possibly also for blending the must with other ingredients to produce different flavors of wine. The archaeologists believe that this winery served the residents of a large manor house whose inhabitants made their living with viticulture and wine production. Evidence was unearthed next to the impressive winepress indicating the presence of a bathhouse. These finds include terra-cotta pipes used to heat the bathhouse and several clay bricks, some of which were stamped with the name of the Tenth Roman Legion. This legion was one of four Roman legions that participated in the conquest of Jewish Jerusalem during the Bar Kochva rebellion, and its units remained garrisoned in the city until 300 CE. Among the Roman legion’s main centers was the one in the vicinity of the International Convention Center (ICC), commonly known as Binyenei HaUma, at the entrance to Jerusalem, which is located just 2,400 ft from the current excavation, where a large pottery and brick production center was once located. The archaeologists suggest that the Schneller site, in the form of a manor house, constituted an auxiliary settlement to the main site that was previously exposed at Binyanei Ha-Uma. As was customary in the Roman world, here, in the Schneller Compound, a private bathhouse was incorporated in the plan of the estate. The current archeological excavation is actually a continuation of the salvage excavations that were carried out at the site half a year ago, when evidence was uncovered there of a Jewish settlement that dated back to the Late Second Temple period. The Schneller Orphanage operated in Jerusalem from 1860 until the Second World War. During the British Mandate, its German inhabitants were expelled and a military base was established there. After the British withdrawal in 1948 the compound was turned over to the Hagana and later served as an army base that was used by the IDF until 2008.